When it comes time to upgrade part of your house, the kitchen is the #1 room most families decide to spend money on. Not only is it a popular room for family and friends to use regularly, but it also does more to increase property value than any other option. 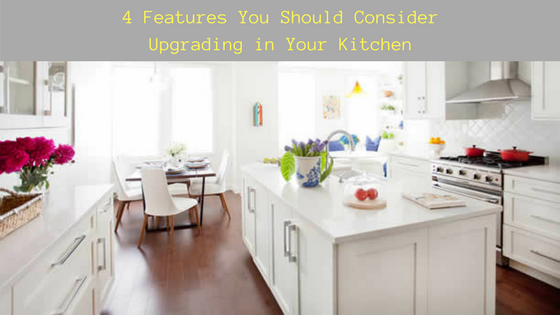 If your budget is limited and a complete overhaul is not possible, you can still get an excellent update by changing or upgrading four distinct features in the kitchen. Why Should You Upgrade Now? According to a recent Houzz study, the majority of people upgrade their kitchens because they are simply tired of the old look and want to spruce things up with more current styles. Outside of actual damage, this makes the most sense. Kitchens can become dated quite quickly, and original homeowners may have skimped on materials and features that did not fit their budget. Another common reason to upgrade the kitchen is due to purchasing a new property and moving. The former owners may have loved the black marble countertops, but you always dreamed about thick butcher block wood. When you move into a home that used to be someone else’s, one of the first things you want to do is make it yours. The kitchen is the heartbeat of the home and the room where family comes together more than any other. It makes sense to budget renovation and remodeling money for it first. Counters came in first when discussing which feature to upgrade first. Not only are they such a large and obvious style choice for the kitchen, but they are also the first thing to get stained or damaged. When combined with new kitchen cabinets, this can do more to improve the look of your kitchen than any other design feature. The backsplash was the next most popular feature to replace in an older kitchen. This is another obvious feature that you will see whenever you use the sink, prepare food, or make coffee in the morning. It is also one of the places people tend to express their creative individuality more. Feel free to replace the Tuscan tile with subway blocks or hammered tin. Depending on the material you choose, the small size of the backsplash makes this an affordable upgrade for many families. Sinks, faucets, and hardware were the third most commonly exchanged kitchen elements. Although these are often upgraded at the same time as the counter, it is easy to replace them without damaging or removing it as well. New, fresh fixtures and more efficient faucets can make everything from bathing the baby to washing vegetables for a salad more pleasant. They can even make your home more environmentally friendly. The fourth most commonly upgraded design option in the kitchen were the walls. Whether you choose flat paint, a unique painting technique, wallpaper, or panelling, kitchen walls can affect the look and feel of the entire room every time you walk inside. Simple paint is probably one of the most cost-effective ways to spruce up the look as well. These top 4 features you should consider upgrading came only a few percentage points ahead of things like cabinets, lighting fixtures, and appliances. While you may choose one of the most popular items to replace first, keep an eye on your budget and carefully weigh costs vs. end results. If your kitchen has a counter, you can live with but 1970’s olive green linoleum, upgrading that first may be the best option. Features mentioned above are worth considering, but It is critical to remember that it will be much harder to replace your cabinets after you have upgraded your counters, floors or backsplash. If you are considering any of these improvements, take a good look at your cabinets and be sure you are happy with the style and layout of your kitchen before investing in these other upgrades. If you decide that new cabinets in your future, it is best to hold off on the other upgrades until you are ready to replace your cabinets. This will give you the most flexibility in designing your new dream kitchen.